Three big tournaments are upon us and for the first time in a long time, there are three overwhelming favorites to win all three. 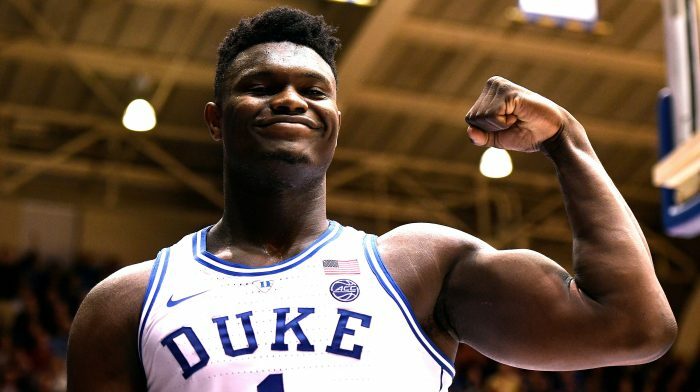 March Madness is only days away with Zion Williamson and the Duke Blue Devils under a two-to-one favorite to win the entire tournament. The Golden State Warriors, winners of three of the last four NBA titles are heavier favorites than that. Las Vegas currently lists them at -200 to threepeat. And my beloved Tampa Bay Lightning have run through the regular season and are looking to bring home their first cup in fourteen years after having come ever so close in four of the last five seasons. The Lightning are also two-to-one favorites to win the Stanley Cup. Here is your task if you choose to accept it. I need for you to tell me whether these teams, in each of their respective sports, will win it, or not win it, in the comments section below. In college basketball, I am giving you the choice of Duke or the field. In the NBA, I’m giving you the choice of Golden State or the field. In the NHL, I’m giving you the choice of the Lightning or the field. Choosing the field in any one of these three sports obviously means the favorite will NOT win it all. As your TIEBREAKER, I want you to list who you think will represent the Eastern Conference in the NBA Finals. Ah, things just got a little trickier. There you have it, folks. Pick away. Duke plays their first game on Friday at 7pm so ALL ENTRIES MUST BE LOGGED IN BEFORE TIP-OFF OF THAT GAME!! The winner of this contest will not only be declared the smartest person alive but will also win a fabulous SportsChump t-shirt and their very own copy of the first ever SIS Football Rookie Handbook for 2019. Happy March (and June), everyone… and happy picking! This entry was posted in Uncategorized and tagged Duke Blue Devils, Golden State Warriors, March Madness, NBA Playoffs, NHL Playoffs, Stanley Cup, Tampa Bay Lightning by Chris Humpherys. Bookmark the permalink. I’m going to get this thing started… and go all chalk. The Duke Blue Devils WILL WIN the NCAA Tournament this year. The Tampa Bay Lightning WILL WIN this year’s Stanley Cup. The Golden State Warriors WILL WIN this year’s NBA Finals. And as my tiebreaker, I predict the Philadelphia 76ers will win this year’s Eastern Conference. Duke, Warriors and Lightning will all win their respective titles. My tiebreaker is that the Bucks will represent the Eastern Conference. Duke, no.. they might not even make it out of their region. Tampa and Golden State, absolutely. The Feild in the NCAA for sure, Bolts and Curry’s Crew. Sixers as my Tie Breaker. NCAA Tourney: Give me the field. NHL Playoffs: I’ll take the field. Tiebreaker: Sixers in the East. Lightning don’t have the cup experience on its roster. Everyone loves Zion. But wait, remember Durant? Texas didn’t come close to the Final Four. Sixers take the East. Brogdon injury hurts Milwaukee. Celtics aren’t the same team. No chemistry. Toronto always finds a way to fold. P.S. The wife still hates sports. And no playoff experience for the Bolts, KP? This is the same core that made the Cup Finals four years ago. Have you seen what they’ve done to the Caps the last two times they’ve played. Oh, there’s gonna be a parade, my friend. To which you’re cordially invited. Perhaps nobody has their thinking skills turned on highly enough. The Tar Heels are a better NCAA TOURNAMENT TEAM than Duke is. Gonzaga isn’t as good as Tar Heels. There was one miserable night in which they gift-wrapped a Sweet Sixteen victory to the Seminoles. But otherwise, I don’t know why you would choose Duke instead of Gonzaga. Three years ago, too many people overlooked the New York Islanders. They beat first-place Florida Panthers, and history indicates that the Islanders should do well against Capitals in this year’s second round. And I don’t know why you would be so sure about NBA’s western conference team, now that Milwaukee and Toronto have their act together. I need your Eastern Conference Champion as a tie-breaker please. I am reminded of the M*A*S*H episode where Klinger and Major Winchester bet that no one will overcome the Dodgers 14 game lead for the 1951 NL pennant. We all know how that turned out. And in case you didn’t notice-, Texas Tech and Florida are in the same bracket again, possible 2nd round match-up. I can’t be convinced about Toronto or Milwaukee, so I’ll say my other friend’s pick: 76ers. How many times do I have to sing your damn fight song. I know it by heart by now. I believe I saw a stat that Tampa has no cup final experience on its roster. The only playoff team with that in play… I could be wrong, but pretty sure I saw that. Will have to check again. Just remember… winning the President’s Trophy isn’t always the best thing. The Caps did it back-to-back years and lost in the second round to Pittsburgh both years. The playoffs are a different beast. Meh, KP, this team doesn’t believe in that nonsense. Another great win against Boston tonight after being down. This team was in the Cup Finals four years ago, losing to Chicago. A ton of players were on that squad. 2 -0 so far. Sorry about TB brother.